As I mentioned in my last post, I have a tie between two Sale-a-Bration items. On Wednesday I shared that Party Pandas was one of them. 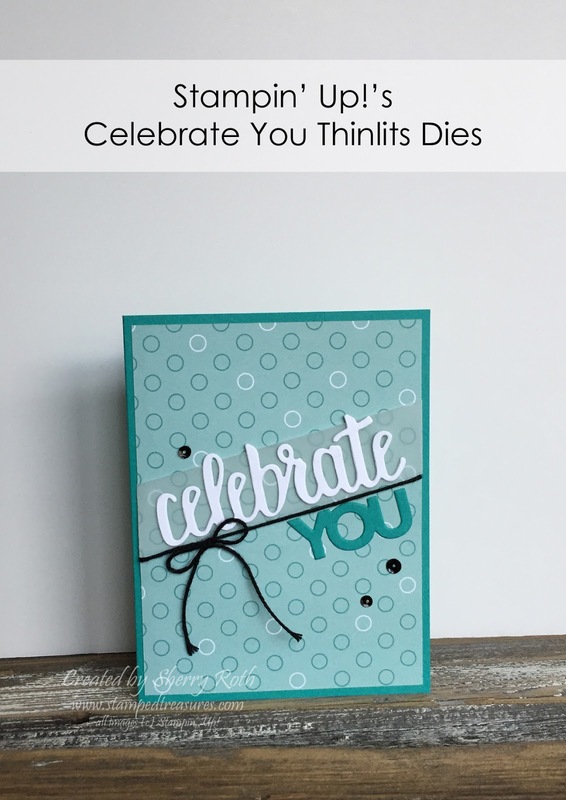 And today I'm sharing my second - the Celebrate You thinlits dies! I absolutely love these dies and have used them so much! There is also a stamp set that coordinates called Amazing You, that you can get for free during Sale-a-Bration. The two combined are really a must have in my books. The Celebrate You thinlits dies are seriously so versatile. I've used them for so many projects already - from cards (for all occasions), to boxes, to layouts. These thinlits can be your for free with a $120 purchase! Today's card is a simple one that really showcases the thinlits. You could easily mass produce this card and simply change out the background dsp for a different look. In the sample I used a pattern from the Picture Perfect Party 6x6 dsp pack. This paper pack is so fun to play with it. With one side with graphic images and the other with photographic imagery, it's something a little different and I'm liking it!